Jo Gartner competed in eight grand prix during the 1984 season for Ossella. 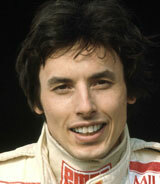 He enjoyed a successful junior career, winning races in Formula 2, but never finished higher than fifth in an F1 race. Even at that race, the Italian Grand Prix, he didn't score any points as his team had only officially entered one car and he was driving the second. He also had a career in sportscars and won the 1986 Sebring 12-hours with team-mates Bob Akin and Hans-Joachim Stuck. However, he died in an accident on the Mulsanne straight at Le Mans the same year, after his car somersaulted and caught fire.